What a day this has been! It's the general concession that short-handed play goes at a faster rate, but to finish any bracelet event in less that four hours takes some doing. Philippe Boucher, from Quebec City tore through his opponents in enough time to allow himself 18 hours rest time before he sits down for the Main Event tomorrow. It actually took more than an hour and-half to lose one player and then it became a one-man show. Every time time a player was all-in against Boucher they were shown the door. One-by-one he busted all of his opponents to storm to the title. Once he took over the chip lead he pounded his opponents, and when he needed luck, that lady was on his side. Jack Ellwood was the first to go when he was unlucky to find inferior aces that stayed behind. Moments later he was followed by Jarred Solomon who got himself in a tricky spot and had to call all-in with a marginal hand because the math was right. The next two to go were Alexander Dovzhenko and Nicolas Fierro. Dovzhenko will probably the least disappointed 4th place finisher in poker history as he came back for Day 2 with just 2,800 chips. He somehow managed to turn that into a €37,529 payday. Fierro will be more disappointed as he came into today as chip leader but nothing seemed to go right for him. We didn't see too many of his hands as he folded a lot post flop. When we did see a hand, his last, he had the goods but was counterfeited by the unstoppable Canadian force. That left it heads-up and it wasn't long before Boucher had Michel Dattani on the ropes and all-in, and we know how that situation turned out. 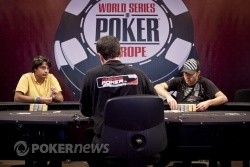 Michel Dattani was down to just a few chips when he decided to pot it for 30,000. Boucher put him all-in and he called giving us the final showdown of the day. The board came down and that's it! We have champion, Philippe Boucher. 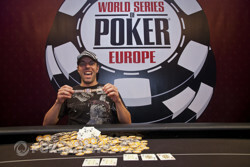 Michel Dattani finishes in second place taking home €76,982. 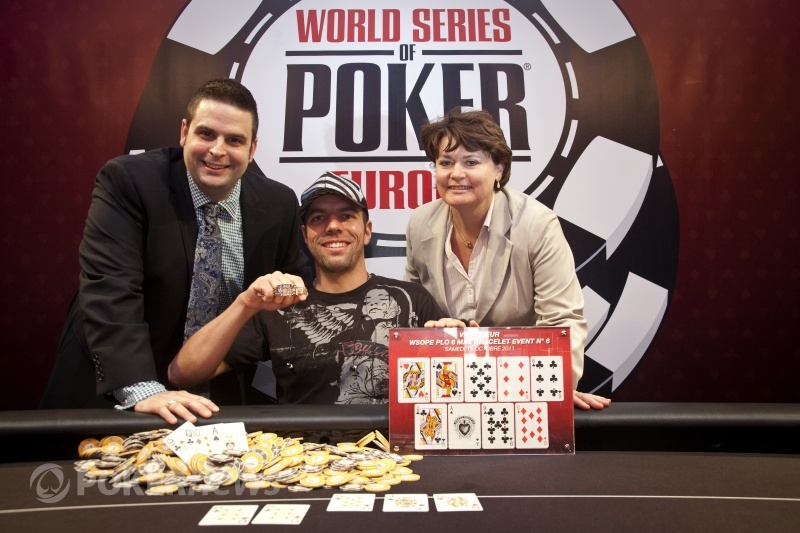 Boucher gets the grand price of €124,584 and the coveted WSOP Gold Bracelet. Michel Dattani raised to 30,000 from the button and Philippe Boucher called to see a flop. He check-folded to Dattani's shove. The Portuguese player won the next three pre-flop and is back up to 110,000. There is a 20 minute break for the remaining two players. From the small blind Boucher limped and Dattani checked. The flop came down and Dattani check-called a 16,000 chip bet. The turn was the and Dattani check-called 36,000. On the river the appeared and Dattani checked for the third straight time. Boucher asked for a count of Dattani chips and made sure he got the pot size right. There was 120,000 in the pot and Boucher bet 80,000. Dattani snap-called and got the bad news when Boucher announced he had a pair of queens. Boucher turned over for the winning full house and Dattani sighed and said he had sevens. Dattani is down to just 78,000 chips. Michel Dattani is down to 225,000 chips after Philippe Boucher keeps chipping away at his stack. They made it to a flop after Dattani had defended a 16,000 raise. The action was checked there and on the turn before Boucher had a 20,000 bet called on the river. The Canadian tabled [x][x] for a river set and took the pot as Dattani had a losing [x][x]. Michel Dattani started as the underdog, and after a couple of hand playing heads-up his deficit has grown to a point where he could start worrying. The Portugese player raised from the button to 16,000 and Boucher called. The flop came down and Boucher check-called a 16,000 bet. On the turn the appeared and Boucher checked once more. Dattani counted out some chips and threw in 48,000. Boucher gently counted out the bet and slowly pushed his chips across the line making the call. The river brought out the and for the third straight time Boucher checked. 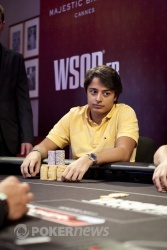 Dattani pondered for a bit before taking a big stack of 5,000 chips and betting 100,000. Boucher called quickly and we got to see the following cards. Boucher took down the pot and increased his chip lead to 4:1.